Samala Moyo is an interactive exhibition with an outreach component that was designed to open the Malawi–Liverpool– Wellcome Trust Clinical Research Programme (MLW) to the local community and creatively explore crucial topics in medical research. The project was developed from a small amount of money from the Wellcome Trust for pilot project, and then subsequently received £188,000 to further develop the project. Samala Moyo aims to promote health education, public engagement and high-quality research through vibrant public–researcher interactions. It engages visitors with their health and the medical research in their country, and builds stronger relationships between science and citizenry. Malawi is one of the poorest countries in Africa, with a heavy disease burden and limited access to healthcare and health information. There are limited facilities for interactive learning, and no other such projects that focus on school-age children. This context highlights the importance of a permanent interactive exhibition that can showcase local medical research, act as a source of reliable knowledge and create a platform for dialogue between researchers, schools and community groups. The exhibition builds on and informs the research centre’s science communication activities such as science cafés, a national radio programme, debates and community meetings. A series of outreach programmes are also offered in rural communities, particularly in schools, where health-related behaviours and beliefs are developed. Crucially, the topics explored (TB, diabetes, vaccinations, malaria and DNA) were identified as important and relevant by the community. Part of the outreach suite that Samala Moyo takes to remote areas of Malawi includes real medical equipment that may not be available in that area. This comes with some important ethical dilemmas as the team delivering the outreach activity do not have medical training and are not equipped to treat anything they may find using the equipment. It is important to consider these kinds of ethical decisions before starting a project, consulting with patients and communities to help anticipate what issues might arise. Caption: Rodrick Sambakunsi describes the Samala Moyo engagement with health project and one experience of a challenge that arose when taking the activity to a rural village as part of the outreach component of the project. The exhibition includes a set of interactive activities that allow children, and adults, to play games that teach science concepts and peak participants' interest in science. 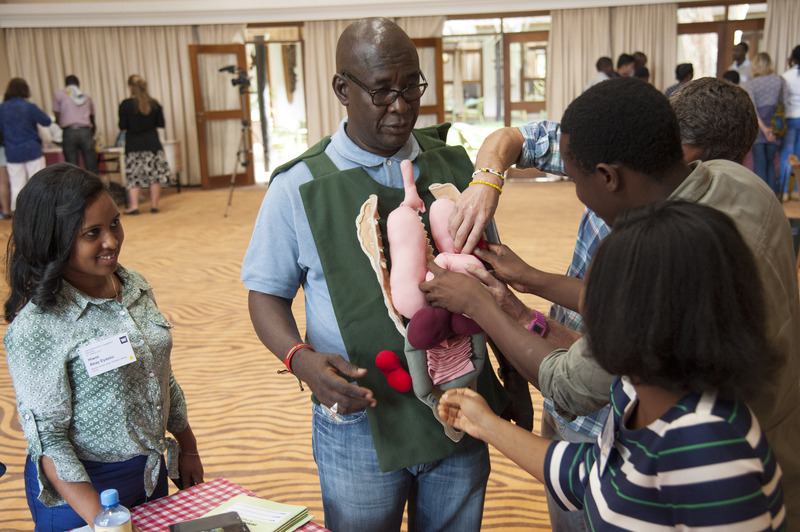 Caption: Rodrick Sambakunsi demonstrates some of the key hands-on activities developed as part of Samala Moyo to participants of the 2017 Wellcome Trust International Engagement Workshop. Creating Samala Moyo meant the development of some very important partnerships. The Museums of Malawi provided training on conducting outreach programmes, and collaboration with the Ministry of Education and teachers ensured the project would complement the school curriculum. Partnerships with these government organisations added to the advice and support from community members, students, community educators, support groups, and community health committees. The research and development stage of the project built a solid foundation for the project’s validity and relevance. As the first science/health museum or exhibition in Malawi, careful research and formative evaluation were essential to ensure it met needs. The topics chosen are relevant to the community and the information has been made accessible despite language and literacy challenges. The project strengthens capacity for future projects by including museum management and outreach training for staff, having an in-house exhibition that allows researchers to engage with visitors and strengthen their communication skills, and training teachers to use creative engagement when teaching science. The programme also includes an internship scheme for secondary-school students interested in pursuing health science careers. In a country where there are an estimated 300 doctors for 16 million people, the need to promote science careers through engagement and mentorship is clear.